AskMe quickly connects people with questions to content and people with answers, helping organizations leverage their most strategic asset – knowledge capital. AskMe delivers business-ready knowledge discovery tools on top of a knowledge management and business process management foundation. This unique and powerful combination enables AskMe to help organizations of any size build knowledge capital that can be used to speed innovation, reduce costs, and improve customer service. Learn how AskMe meets these challenges. Connect the right people at the required time. Focus the conversation on topics of importance to the organization. Mine for relevant content within the Knowledge Discovery business system and from existing corporate data stores such as Microsoft SharePoint® and Microsoft® Exchange. Provide tools for measuring the output of collaborative interactions for business value and desired outcomes. Publish and store the results of the collaborative effort for future use across the organization. AskMe meets all of these goals and helps organizations build and leverage their knowledge capital for competitive advantage. The AskMe portal – a fully featured Web application with built in collaboration capabilities. Microsoft® SharePoint® – AskMe functionality can be seamlessly added via Web parts to SharePoint Team Sites. Microsoft® Outlook® – users can ask questions, follow conversations and get answers without leaving Outlook. Network appliance – AskMe deployed on a Hivemine-provided physical or virtual appliance behind a firewall. Public cloud – AskMe as a SaaS (software-as-a-service) solution via Hivemine's public Cloud provider partner. This is an ideal option for mid-sized companies, business units within large organizations, and enterprises wanting to start small and scale their AskMe deployment as their user base grows. Private cloud – AskMe deployed as a multi-tenant SaaS solution within an enterprise's private Cloud for IT organizations wanting to offer AskMe as an internal service. For over ten years, AskMe has helped Fortune 500 companies build their knowledge capital in complex enterprise environments. From sophisticated workflow features to deep integration capabilities including Microsoft SharePoint, Microsoft Exchange, and enterprise search, AskMe is proven in the enterprise and ready for deployment in any size of organization. 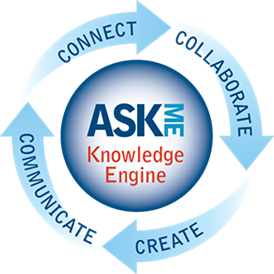 AskMe increases knowledge capital organically through a continuous engagement cycle. AskMe connects people to people, and people to useful content. AskMe gathers feedback and proactively shares new knowledge. AskMe makes it easy for people to engage with each other. AskMe turns ad hoc dialog into assets that anyone can use. More powerful than keyword searching alone, AskMe helps users get to answers faster by matching experts and/or existing Knowledge with specific requests for information. System generated user profiles to insure all potential people and their expertise are evaluated when responding to requests. Customizable user profiles to enhance AskMe's ability to match an information request with the right expert(s). System defined expertise categories with pull down sub-expertise options. An optional add-on module that continually scans and analyzes email and document content to automatically generate tags. 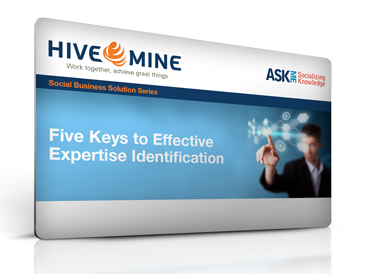 AskMe expert location functionality is enhanced by using these tags to provide users with suggested domain and topic expertise that can be added to their profile as searchable keywords. Display relevant documents and content from Microsoft SharePoint or Exchange Server data stores. AskMe provides a virtual workspace for community members to engage in discussion around specific requests for information and business challenges. Allows community members to see the full conversation thread so they can understand the genesis of a request for information and join in the conversation at any point. Provides users with full control over community memberships, news feed subscriptions, communication preferences and frequency. Ability to create communities by general users to facilitate knowledge sharing. Provides continuous knowledge capital refinement through tools that provide feedback, rate the value, and mark obsolete specific responses and published content. Rapid routing of information requests to the right expert(s) and communities. Review and approval of Best Practices prior to publication. Robust Reporting: Provides system-level analytics, usage metrics and ROI data.